Boeing 787-9 Dreamliner operated by El Al offers 282 seats of three classes. First 8 rows of seats are offered to passengers of business first class. The seats in these rows have 1-2-1 configuration. These are 32 open suites that have 180 degrees recline. Close location to the galleys and lavatory are the only disadvantage of the seats of the 9th (that is actually 1st) row as well as for the seats of the 16th row (the last row of the section). A and K seats of the rows 9, 11, 13 and 15 are a little angled towards the aisle as well as D and G seats of the rows 10, 12, 14 and 16. The seat 9K may be chosen by passenger travelling with a baby because these seat offers space for bassinet. 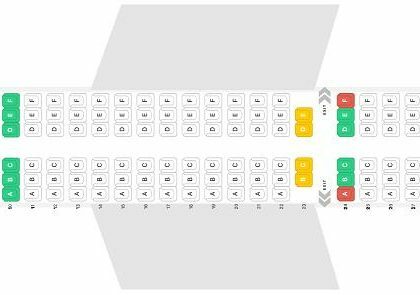 For passengers who are travelling alone and need some private space will be ideal A and K seats of the rows 10, 12, 14 and 16 because these seats are separated from the aisle by a side table. Passengers who are travelling with a partner may choose D and G seats of the rows 9, 11, 13 and 15. These seats are perfect for couples. Behind the exit row 28 recliner seats of premium class are located. These seats are located in 4 rows that have 2-3-2 configuration. These seats are considered premium seats because they have extra legroom, extra seat width and 7 inches recline. Location of the bulkhead, lavatory and galley in front, lack of floor storage during take-off and landing may cause some discomfort to passengers of the seats of the 17th row. Passengers traveling with infants are often seated on the seats 17DFG because bassinets may be placed on the bulkhead. 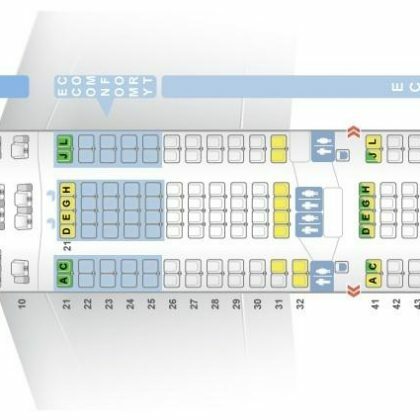 Economy class seats are divided into two sections. There are totally 222 standard seats here. First section of economy class seats contains 12 rows of seats. First 10 rows have 3-3-3 configuration and the last 2 rows of the section contain just 3 seats each. The seats of the 21st row are designated as Preferred seats. An extra fee must be paid to choose these seats. Passengers of these seats will take advantage of extra legroom. However, these seats have no floor storage during take-off and landing. As the tray tables are entertainment displays are built-in the armrests making them immovable and thus reducing the width. For passengers who are travelling with infants the seats 21DFG provide possibility to attach bassinet to the bulkhead. The noise from the galleys and lavatories will cause discomfort to passengers of the seats 30ABC, 30DFG, 30H, 31H and 32H. Limited recline and reduced personal space when the seats in front are reclined are other disadvantages of the seats 30ABC, 30DFG and 32HJK. Behind exit row second section of economy class seats with 15 rows is located. Passengers of the seats 45ABC, 45HJK and 46DFG will take advantage of extra legroom. Among disadvantages of these seats: reduced seat width because tray tables and entertainment monitors are located in the armrests, no floor storage during take-off and landing and location of the lavatory and galley area in front. Protrusion of the exit door inside reduced extra legroom of the seats 45A and 45K a little. To choose the seats 45BC and 45HJ extra charge must be paid because these seats are designated as Preferred Seats. For passengers of the seats 46DFG travelling with babies a bassinet may be installed on the bulkhead. The only disadvantage of the seats 58D and 58G is close location to the galleys and lavatories. When the seats located in front are reclined personal space of passengers of the seats 58ABC, 58HJK and 59DFG is limited. Because of the bulkhead located behind these seats also have limited recline. The noise from the galleys and lavatories located behind is one more disadvantage of these seats. All these disadvantages make these seats bad seats.